I’m 35 and I’ve been writing as long as I can remember. The first thing I solidly remember writing was a story about a cruise ship crash that I wrote in fifth grade. I think I must have been a pretty morbid ten year old. I live in Arizona although I wish I didn’t, and I’m going to be married this December to my girlfriend/zucchini of ten years. I have three cats and one dog, all rescues. I once named a pencil Mr. Universe. Now share a little bit about your books. I have so many of them! Modern fantasy, or fantasy that takes place in a mostly real world setting with a few twists, is my favorite jam. I write some soft sci-fi, although I’ve never been good at hard sci-fi because of how technical it can get. I’ve also written some classic fantasy (with dragons!) and even some real world drama. I love a good mystery. Almost all my books have some element of mystery to them, because it’s my favorite kind of plot. Creating characters is my favorite part of writing, which is probably why I wind up with so many in each story! Some of your books started out as fanfics. How do you go about converting a fanfic to an original book? When I see a fanfic and think “that could actually stand pretty well on its own”, the first thing I do is try to change everything I can. The story’s location, characters’ gender or race or career, any major plot point that doesn’t need to be specific. Can that car accident become a drive-by shooting? Can that woman who died of an illness have fallen down her stairs instead? Since my fanfics tend to have a loose approach to canon in any case, that’s often enough change to make it an original, although the real alternate universe fics are the ones that are easiest to convert. What’s the biggest difference between writing fanfic and writing original fiction? Puck, from The Sum of its Parts, will probably be one of my favorite characters forever. I absolutely love writing “that normal guy in amongst a bunch of supernatural scary creatures” – it’s one of my favorite tropes. Especially when that normal guy is by far more dangerous than the supernatural creatures. Hands down, when Connor comforts Puck in the hospital after his father is hurt. Favorite moment in that whole series. I just love the two of them and their relationship so much in that moment. If you could sit down for a chat with any author, living or dead, who would it be and why? Right now I’m working on converting The Boy in Red, which is the fourth installment of The Sum of its Parts. Plus I’ve been trying to get one of my other works, The More Things Change, published by an actual publisher instead of by me, heh. I’ve also been writing a lot of fanfiction lately for the Malec fandom! I can’t get enough of those cuties. You can find E M Holloway’s books on Amazon. I interviewed Garrett Robinson about his fantasy novels. Unfortunately, I had some technical issues with the call recording so what I’m sharing here is only the first few minutes of the interview. I apologise that I’m not able to share the entire interview. 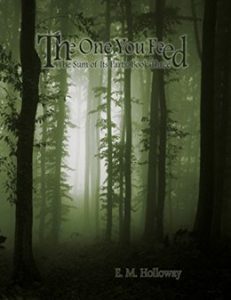 If you want to know more about Garrett’s books, you can check out his website at http://garrettrobinson.com or find his books on Amazon. Please share a little bit about your books. Right now, I have two books out. 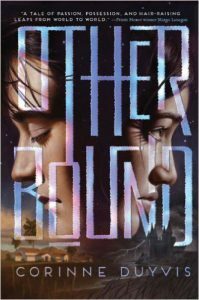 My first book, Otherbound, came out in 2014. It’s a young adult fantasy novel which is about a boy from our world who witnesses the life of a mute servant girl from another world every single time he blinks. She has no idea—until they learn to communicate, and they have to work together to discover what binds them together. 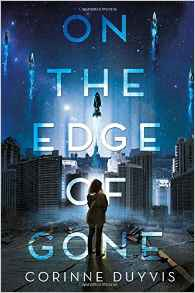 My second book, On the Edge of Gone, came out in March 2016. 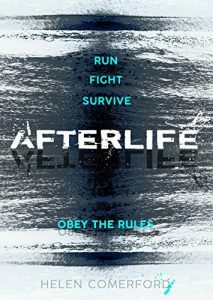 It’s a young adult sci-fi novel about an apocalypse-in-progress: a guarded, autistic girl tries to keep her family together in the immediate aftermath of a devastating comet impact. Ohh, choosing favorites! That’s always hard. I think I’d have to choose Cilla from Otherbound, as I found her an unusual and intriguing character to write—that balance between sweet and haughty, well-intentioned but clueless, made her very appealing to me. From On the Edge of Gone, it’s Denise herself. I just related to her a lot—which probably isn’t surprising, since a large part of the reason I wrote her was because there were so few autistic characters for me to relate to! Could you explain a little bit about the Disability in Kidlit program? Disability in Kidlit is a website I co-founded alongside author Kody Keplinger in 2013; it was originally intended as a sort of temporary blog fest but turned into an actual resource. We post reviews of the portrayal of disability in MG/YA novels, write articles about tropes and stereotypes, and discuss representation from various angles. All of our contributors identify as disabled themselves. I’m so very proud of what we’ve accomplished over the years. A lot of people have expressed gratitude and stated how helpful the website is to them, which means the world to me. Your books are great examples of diverse fiction. Could you tell us why you feel so strongly about diversity in fiction? Once I started seeing (a) the extreme imbalances in both the real world and in fiction and (b) the results in society, I found it impossible not to care strongly about this topic. After all, these imbalances didn’t appear out of nothing. They’re a result of an unjust system, which doesn’t go away by simply waiting, hoping, or asking. I don’t want to support that system. My thinking is: If I’m a writer, I have to make a choice—whether conscious or unconscious—about who it is I write about, and how I do so. Will I perpetuate the problems and imbalances, or will I try to do my part in combating them? That doesn’t mean I should arrogantly try to “fix” everything myself and tell stories that aren’t mine. It means is that I try to be aware of my choices, and make those choices conscious ones. Sometimes, the best choice is to step away from a certain character and story, as I’m not the right person to write it. Instead, I should listen to those who are the right person to write these stories, and do what I can to help their voices be heard. What has surprised you most since getting published? I think the ups and downs and backs and forths. It’s not like you’re just taking a step forward. Instead, one part of your life shifts, and the rest doesn’t necessarily shift with it. So on one hand, your life is completely different: you’re put into different situations, you worry about different issues, and you have different concerns to keep in mind. Being published is such an entirely new set of experiences. At the same time, nothing much has really changed. You’re still thinking up stories, you still have to do groceries and scoop out the litterbox, you still geek out with friends and eagerly anticipate the next book in someone else’s series. Sometimes, you’ll pause during the cool parts of being published and realize, wow, when did this start feeling so normal? Or you pause during the regular everyday things and think, wow, I’m actually balancing this average life with signings and book deals and interviews? It’s a constant seesaw. After several years, I’m still figuring out how to incorporate and balance it all. What advice would you give to someone just getting started writing books? As corny as it sounds: just keep going. I must’ve written over ten books by now, and I still find myself constantly procrastinating, constantly doubting myself, constantly comparing myself, constantly getting distracted. Life throws so much your way that can distract you from writing, whether it’s obligations or brain chemistry or rejections from literary agents or more. But if you just keep going, you can’t go wrong. You’re always learning and developing as an author, and the more you write, the more material you have to work with. Don’t get discouraged. Don’t use preparation as a means of procrastinating. Don’t linger on the rejections. Don’t spend years on the same project if you aren’t making actual progress on that project. If you want to find out more about Corinne Duyvis and her books, check out her website at http://www.corinneduyvis.net or you can connect with her on Twitter or Tumblr. You can find her books on Amazon and I have reviewed On the Edge of Gone here. I live with my family in Calgary, Canada, and I spend most of my time chasing after my toddler and writing about fantastical things. The trilogy is about a young soprano named Cécile who is about to depart her family farm to join her mother on the opera stage in the big city. But before she can leave, trolls kidnap her and bond her to their crown prince, Tristan, in order to break the curse that has bound them to their underground kingdom for five centuries. Cécile is initially focused on escape, but she finds herself embroiled in the burgeoning revolution of the oppressed lower class of half-bloods who desire to overthrow their tyrannical king. A revolution that is lead by Prince Tristan himself. As she becomes more sympathetic to the trolls, and falls in love with Tristan, she has to decide whether freeing her friends is worth the risk of unleashing the trolls’ magic on the world. And she must live with the consequences of whatever path she chooses. 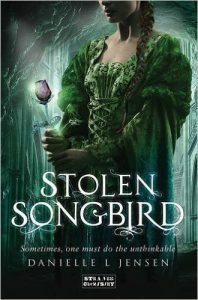 You were a finalist for the Best Debut Author with Stolen Songbird on Goodreads Choice. What was that like? Incredible! Unlike most other awards, the Goodreads Choice nominations are based on reader response and reviews, and to have so many people love STOLEN SONGBIRD enough to vote it into the finals was not something I’d dreamed possible. This surprises people, but my favourite character in the series is King Thibault. 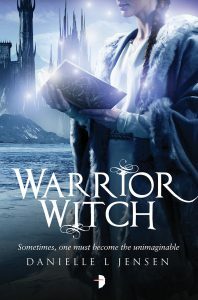 I’ve always known that he’s a troll with enormous depth, but much of that isn’t revealed until WARRIOR WITCH, which was one aspects of writing that novel that I enjoyed the most. He’s a hidden and guarded character, but his actions drive so much of the plot. Music is obviously important for the character Cecile. Is music an important part of your life? Not at all! I can’t sing, play an instrument, or even read music. I very rarely draw upon aspects of my own personality or life when I create my characters, and Cecile, in particular, is nothing like me. Probably the amount of time I’d spend on things that aren’t writing. Interviews, guest posts, read-alongs, events, social media, and giveaways take up a large portion of my workday, which wasn’t something I expected prior to publication. I am blown away by Maggie Stiefvater’s prose – her writing is beautiful, and I aspire to be half that good some day. I admire the way Sarah J Maas creates such exceptional worlds that absolutely captivate her readers. I am continually in awe of Susan Dennard’s ability to find creative ways to engage with her readers, as well as the incredible amount of effort she puts towards helping aspiring writers with all the information on her website. My close friend Elise Kova, besides being an amazing writer, is a master of the business side of publishing, and she has inspired me to take more active control of certain aspects of my career. J.K. Rowling. Not so much because of Harry Potter, although I’m a huge fan, but because she’s created such an enormous and successful empire. I would love to pick her brain. Seek out criticism of your work and learn to embrace it. The big turning point in my writing career was when I stopped letting my pride get in the way of accepting and working with critiques. And check out Susan Dennard’s website – it has far better advice than I will ever give. 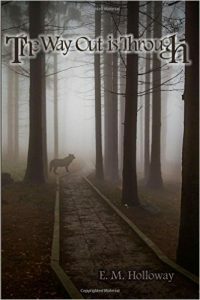 If you want to find out more about Danielle L Jensen and her books, check out her website at http://danielleljensen.com, or you can connect with her on Twitter or Facebook. Her latest book, Warrior Witch, is now available on Amazon.